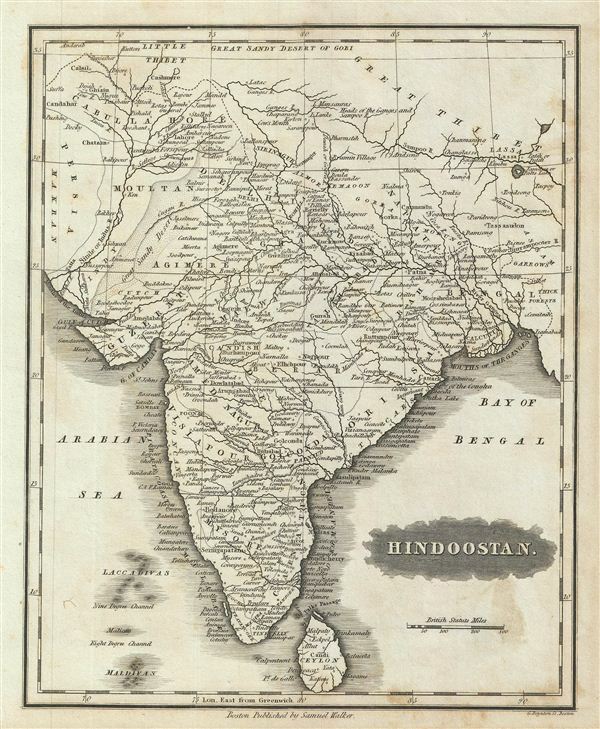 This is an attractive example of the 1828 Malte-Brun map of India or Hindoostan. The map covers the entire subcontinent from the Gobi Desert to Sri Lanka (Ceylon). The Maldives and the Lakshadweep Islands (Laccadivas) are included. Though there is no specific reference to British dominance in the region, most of India had, at this juncture, had fallen under the control of the British east India Company. Various, important rivers, islands, cities and other topographical details are noted. This map was published by Samuel Walker in 1828 as part of the American edition of Conrad Malte-Brun's System of Geography, Vol. I.